This is an absolute favourite from which you can see Dartmoor and Exmoor as well as the panoramic landscape of Mid Devon. The iconic Raddon Pine is there to be hugged part way round; the views from beneath the tree are superb. From the centre of the village walk west along the lane to Chapel Cross (signed for Shobrooke), then join the footpath heading north west past Raddon Hill Farm and Kitlake. From Kitlake follow the lane towards Strong's Brake and before you get there, by an old barn, take the footpath heading east up onto Raddon Hills. 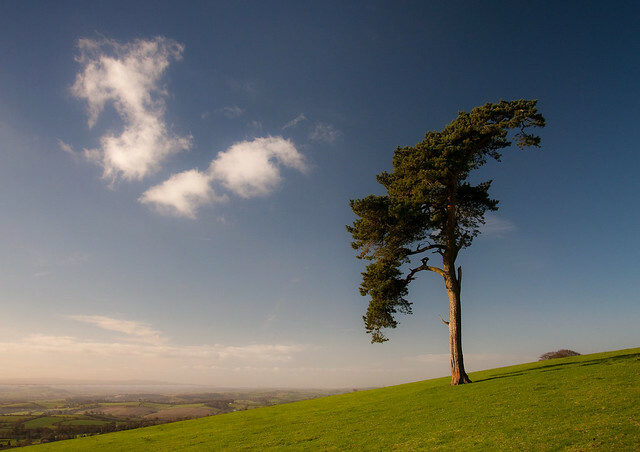 Continue past the lone pine back to Raddon Hill Farm, then either retrace your steps or walk back along the lane. One of the most well-known tors of Dartmoor, Haytor is surrounded by a network of paths some of which follow the old granite tramways. 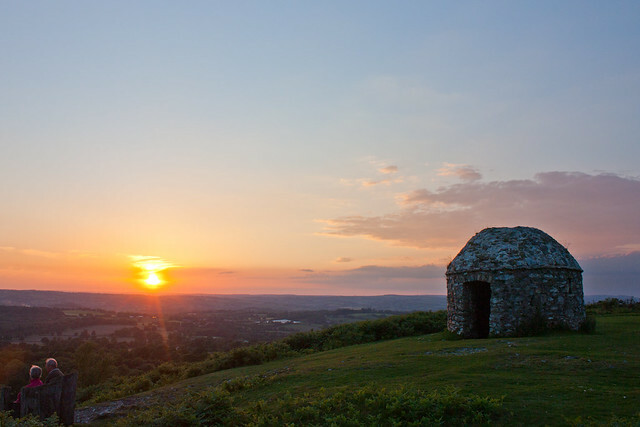 You can make this a really short walk – just up to the tor for a picnic and to admire the view – or a wider exploration of the area. Make sure to pick a clear day. If you are planning on striking out across the moor be well-shod, happy with walking across open moorland and conversant with map-reading and using a compass. There are many routes to choose from. One I like starts from the Visitor Centre, heads up to Haytor then drops down to Haytor Quarry for a stroll around the idyllic pond area. After that you can join the Templar Way heading west to Holwell Tor, from which there are more amazing views. North from here brings you to Smallacombe Rocks after which there are various lovely grassy tracks heading east across Haytor Down. Follow the moorland road back to the Visitor Centre or finish off with another burst up on to Haytor – you never lose sight of it throughout this walk. The outward section of this walk is mostly along a fabulous stretch of North Devon coast with views to Lundy. It passes the peculiar Blackchurch Rock which always reminds me of the Monopoly iron. There's a chance to explore unique Clovelly before returning through farmland and woodland. Blackchurch Rock � how did the Monopoly iron end up on this beach? From the car park permissive paths head north to join the South West Coast Path. Follow this east all the way to Clovelly. From the village follow the road to Clovelly Court then join the well-signed bridleway heading north and west all the way back to Brownsham. Start point: National Trust Car Park at Brownsham. Grid ref: SS285259. Postcode can be misleading! Refreshments: Available in Clovelly (EX39 5TA) though be aware that there is an entry charge for access via the Visitor Centre. The historic beacon hut on Culmstock Beacon can be seen for miles – and when you're up there with it the views are jaw-dropping. It's an interesting place to ponder the local history and imagine the chain of beacon fires of which it was once a part. I've been up here in all weathers, including a blazing summer when the beacon was unintentionally on fire. From Culmstock follow the road heading north out of the village, eventually joining the footpath going through Dalwood Farm. From here follow the track to Blackdown Gate, then head up through the access land on a broad track. Take another broad right-hand track to find the beacon hut at the south-east promontory of this high land. From the hut, follow the path round the edge of the access land, heading north-north-east, then follow the track heading down through Culm Davey Plantation, beneath magnificent beech trees and passing an isolated cottage, Little Thatch. Tracks and lanes bring you to Culm Davy. Follow the lane then the byway going south west, then join the footpath to Pithayne Farm. Successive footpaths heading generally south bring you through Pitt Farm and, eventually, to the river Culm. Follow the meandering river south west, back to Culmstock. Wonderful South Hams coastal views are a big feature of this walk: to the Mew Stone and, on a clear day, to Eddystone Lighthouse. The lighthouse which stands today is the fourth to be constructed. The coastal walking is magnificent; the latter stage of the route follows idyllic creeks. From the car park in Noss Mayo follow the footpath south past Brooking's Down Wood, walking through farmland to join the South West Coast Path. At the coast head north west (sea to your left) and stay with the coast path all the way round to Ferry Wood. From here a permissive path and then the lane brings you back to Noss Mayo.